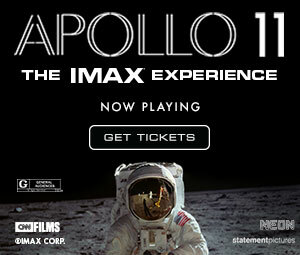 In celebration of 50 years since the historic moon landing, new footage is being released as part of this limited release feature-length documentary showing in select theaters and IMAX across the country. Apollo11 features never before seen large format footage of the mission to land on the moon led by commander Neil Armstrong and pilots Buzz Aldrin & Michael Collins. A journey that should only be experienced on the big screen.